E. Keil and Company Ltd originally made reproduction furniture. The company was founded by Edward Keil. He worked on the De Havilland Mosquito production line during World War II. His son, another Edward known as “Eddie”, got the idea of producing balsa wood models from a visit to America. 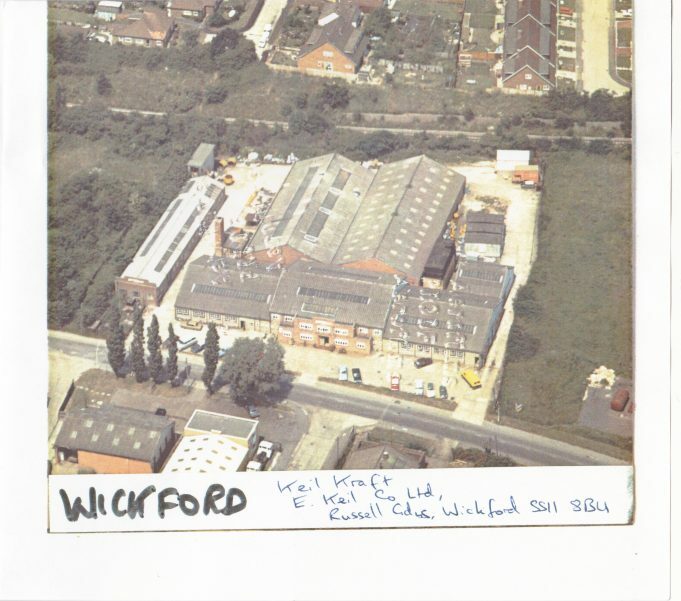 In 1954, in need of more space, the company moved from Hackney Road in London to Russell Gardens in Wickford, not far from the family home in Canvey. The company’s kits of rubber-band or small diesel motor powered model aircraft and boats became very popular with boys during the 1950s. The boxes they came in apparently had “Made in Wickford Essex” printed on them spreading the name of the town far and wide. Aeromodelling was a major hobby in those days and kits sold in their tens of thousands through local model shops. Eddie was a member of the “Model Aircraft Traders Association” and the Wickford Chamber of Trade. Production continued into the 1970s. Eddie died in an accident on the A127 in 1968. Ernie Webster, one of the design team, lived in Wickford with his family in a cottage called Ajax, next to one called Achilles, which the company built for employees. The Websters later moved to the Runwell Road. Ernie left the company in the 1960s and trained as a teacher of art and English. He taught in Wickford for a while but left the town to gain promotion. He moved back to Essex when he retired. The Keil Kraft company, “the greatest name in model kits”, no longer exists but a company known as “The Vintage Model Company” still produce replicas of the original balsa wood models. Remember them, they were still working there in 1976 when I had a look around the showrooms, with completed planes hanging from the ceiling.